1) All T-Shirts are $12 US. Yes, this is a little high for a t-shirt. But, we are trying to get a decent margin so that we can purchase more shirts in the near future, as well as fund other Save Tulane Engineering endeavors. We are not in this to make money. Every penny will be accounted for. 2) No Shipping: We are not allowing shirts to be shipped at this time. This may change in the future depending on demand. 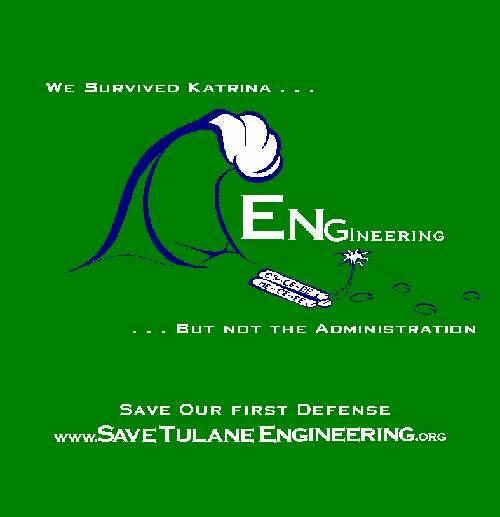 3) Shirts are being delivered to the Save Tulane Engineering team during the first week of January. We will be available to distribute them on-campus during dates and times that will be determined. These places and times will be posted on the12th of January. If you are on-campus before then and want your shirt, send us an e-mail at Staff@SaveTulaneEngineering.org.We will try to accommodate your requests. 4) If we run out, which we probably will, we will be ordering a second batch. We anticipate the turn around time will allow a second batch to be delivered before the 17th of January. Rest assured that we will get you your shirt if you order one. 5) No Refunds. That is unless the shirt is defective in some way shape or form. 6) We accept most major credit cards via Paypal and you can use your Paypal membership as well. If you have any problems. E-mail us at Staff@SaveTulaneEngineering.org. *Items on Pre-Order will be placed with our next shipment.